Hedera Helix 'Ingelise' is a moderate growing vining plant, groundcover plant and perennial plant that can be grown in USDA Plant Hardiness Zones 5A through 9B. It matures to an average height of 1 inch to 1 foot and an average width of 2 feet to 4 feet, depending on climate and other environmental factors. It prefers growing in a location that provides full sun, shade, morning sun with afternoon shade, morning shade with afternoon sun or filtered sun and grows best when planted in sand, loam, clay or silt soil that is well drained. The foliage is dark green in color. It attracts visual attention and is resistant to deer, drought, insects and heat. Ingelise Ivy can be useful in the landscape along woodland borders, in mass plantings, in foundation plantings, in containers or planters, as a border or edger, under a shade tree, as a groundcover, in hanging baskets, in landscape beds or islands or for erosion control and also in shade gardens. 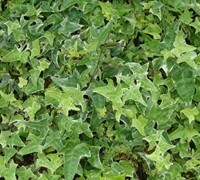 Ingelise Ivy, Hedera helix ’Ingelise’, is a wonderful white variegated English ivy. It has small, glossy, variegated green leaves with a bird’s-foot or narrowly-lobed shape. The variegation is white and grey-green with a narrow band of white on the margin. As plants grow aerially, they develop bushier, more mature growth and develop sharper, triangular leaves with no lobes. Plants have a moderate growth rate and prefer shelter from the hot summer sun in USDA Zones 7 - 10 but will tolerate full sun in cooler climates. This is a very tough plant that shrugs off drought, heat and humidity and can even handle light foot traffic. Ingelise Ivy is very easy to grow and maintain. It will flourish in most garden soils, including heavy clay, but prefers well-drained fertile soils that are not too alkaline and do not stay constantly soggy or wet. Any time of year you can trim to shape when growth gets excessive and tie in to encourage climbing up trellises. It will survive heavy shade or full sun, however prefers some afternoon shade in hotter climates. It is great for growing as an evergreen groundcover in small or large landscape beds or to climb or cascade over walls or trellis, where it can provide an attractive all year foliage cover. It will climb tree trunks but we suggest not allowing it to grow up a trunk any further than you can maintain it. It is most commonly used as a ground cover in warm climates, where the lush leaves steal the show underneath trees or growing up their trunks. It is also highly useful as a trailing plant in hanging baskets and pots. If you're looking for an attractive groundcover with year round interest Ingelise is hard to beat for the ornamental value in the garden!